Celebrations of Learning heighten the level of excitement among the Detroit Achievement Academy learning community. Students know a Celebration of Learning is a coveted event when they get to show off and display the hard work and learning they have done about a topic for their families and the school community. 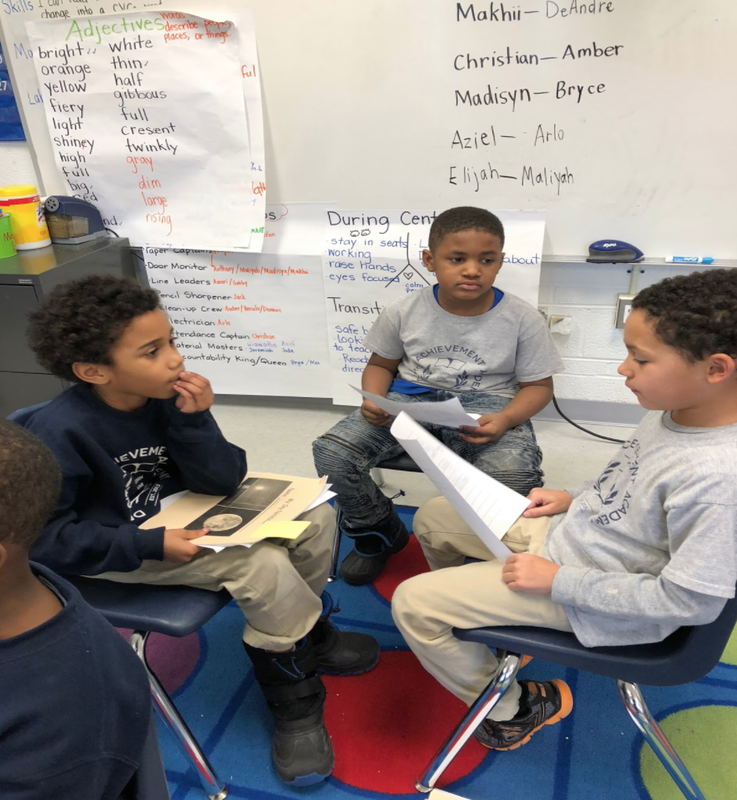 For three months, my first grade students studied the sun, moon, and stars, and at the beginning of February, they shared their hard work during this culminating event! Families spent the evening as “students,” while students transformed into “teachers “ or “experts” on the sun, moon and stars. When we began studying this unit, students created a KWL chart --What I KNOW, What I WONDER, What I LEARNED. At the time, they could only fill out the ‘K’ and ‘W’ because we had just started our unit. Students had many wonders about our topic — “Where does the sun go at night? How does the moon change shape? How hot is the sun?”. While students had a tiny bit of knowledge beforehand, I looked forward to seeing the ‘L’ column (What I LEARNED) grow throughout the unit. We began our unit by reading a letter from a curious boy who wanted to learn more about the sun, moon, and stars. This boy exemplified the curious first graders who sat before me. Through various narrative texts, students began to understand why the sun, moon, and stars inspire authors. Some of our read-aloud books included, Papa Please Get the Moon For Me by Eric Carle, Summer Sun Risin’ by W. NIkola-Lisa, and Kitten’s First Full Moon by Kevin Henkes. Students responded to these books through role-play and written response. During our second unit, students began focusing on the science concepts of observable patterns in the sky. They tracked observations of the sun, moon, and stars through pictures and videos in their Sky notebook, something they will share during the Celebration of Learning. The final unit focused students on a read-aloud book What the Sun Sees, What the Moon Sees by Nancy Tafuri. Students first read the book to understand details about the sun and moon at different times of day. They used this book to inspire writing their own narrative poem about the sun. Students received feedback from their peers to help them revise their poems. This culminating project, a three-verse narrative poem about the sun, was another exciting piece of work students shared with their families. Students had opportunity to share all of the information they have learned and created as ‘experts’ during our Celebration of Learning. First graders sang a song, taught families a sun and moon movement routine, and presented their work in small groups to their families. Families were given a “question sheet” featuring the guiding questions from our unit to ask students throughout their presentations. Students’ responses showed off their learning! During the weeks leading up to the Celebration of Learning, students were busy preparing to ensure they become ready and confident to display their expertise. They rehearsed, practiced, and received feedback from their peers. Prior to arriving to our Celebration of Learning, families were asked to fill out the same ‘KWL’ chart students filled out at the beginning of the unit. Families only filled out the ‘K’ and “W”— what I know and what I wonder. Once the presentations concluded, parents filled out the ‘L’— learning, and students were able to see all the information their family learned from them! It was so exciting for our whole crew!